Spring and early summer is quickly booking. March-May is almost booked up but there are still a few dates left to get out on the water for spring Trout, Shad, Stripers, bass, or steelhead. If you missed the spring look into June and July for summer trout, stripers, and bass. Lower Sacramento River - Last March and into April on the Lower Sac were some of the best trout fishing I have ever seen any where on the planet. March is usually one of the best months on the sac with caddis, PMD, and March Brown hatches providing steady nymphing fish throughout the day. The lower Feather River sees a great run of Spring steelhead each year and march through mid May are prime time to nymph, swing flies on switch rods or light spey rods, or even catch one on a dry. I will have switch rods in my boat this spring so if you have been thinking about trying swinging flies for central valley steelhead this is a great time to get out. The spring fish on the feather are some of the most willing I have found to hit a swung fly. Shad should be moving into the rivers by early may this year and with lower then normal water levels it should be a great year for shad fishing and wade fishing for shad on the Lower Sac. I will be offering my evening shad trip for two anglers this year for $225. I have listed some weekday evenings I have open above. Should be a great year to get out the switch rods and spey rods to wade fish for shad or kick back in the boat. Spring and Summer striper fishing is some of the funnest fishing I think around as any fish you hook could be 6 inches or 60 pounds. Last summer we saw really good numbers of resident fish in the 5-8lb range and had clients sight casting to many double digit fish...even some that were fish of anyones life time. This is as close to salt water fishing as we get in the valley, casting big rods, big flies, and even getting to sight fish to some very large fish. Evening, half day, or full day trips are available. Smallmouth and Largemouth bass on the Lower Sac, Feather, or area lakes are a ton of fun. Catching bass is no longer a secret in the fly fishing community but many of the areas we fish off the Lower Sac and Lower Feather still fly pretty low under the radar. April - June is best for these guys but good top water evening fishing will last well into June. If you have ever tried carp fishing you know the challenge is part of the fun. This year should be interesting with the lower water levels in many of our reservoirs. If carp fishing interest you I would get out during the spring and early summer as many of the flats will be high and dry I think by mid June. Monday Morning Product review...in preparation for Spring and Summer. I am a big believer in the little things in life. It is the little things that make a difference in the world. My world is ripe with examples of this…Yellow mustard on a hot dog vs. spicy brown, or eating that hot dog at a ball game or at home can change that hot dog from just a hot dog to a religious experience…. A little to the left or a little to the right on a clients cast to a trout sipping in the foam or a striper cruising a weed line can change ecstasy to abject failure in a few seconds, and a cast with such promise becomes a cast that haunts them for weeks or years… I have made a few casts that still haunt me today. It is these little things that I have always thought Simms Fishing Products has done so well. Any angler that has ever worn Simms products comes to realize very quickly that they make the most durable, comfortable, and innovative fishing products around. Add the fact that they use the best fabrics and technology available and they make the best fishing products on the globe. That said because of those things I think many anglers over look the little things that make Simms Products so good. It easy to review waders, boots, and jackets, as these are all big ticket items and one would expect these things to address the little things when it comes to features, but what is so great is that Simms pays attention to the little things whether it is on a $500 pair of waders or a $20 trucker hat….and these little things are what make the difference between good and the industry’s best. 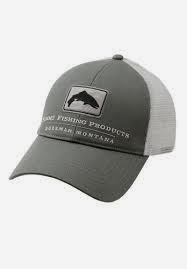 Everyone wears trucker hats now a days, from the 20 something year old slanging flies at my local fly shop to my 65 year old client talking about the good old days on my local river. Personally, I wear the Trout or Bass trucker on a daily basis. They are so sweat stained after the last spring and summer that they are about 3-4 different colors across the front. This looks a little funky, but makes for some serious fish mojo. One might think that these are just cheap trucker hats that Simms throws their logo on and then charges $20 for…no no no my friend, someone put some thought into these. Under the bill of these caps is black and most trucker hats do NOT have black under bills. Well it is the little things that make a difference, like the addition of one more twist of dubbing that takes a perfectly proportioned birds nest to a vintage 70’s Penthouse bushy birds nest that no self respecting trout in the river will eat. Black under bills on hats reduce glare when wearing sunglasses while on the water or anywhere for that matter. Ask Major League baseball why all their Majestic Game Hats, no matter what color the team is, or the hat is, have black under bills. Just like the Bigs, Simms does the little things. Black under bills...Just like the Biggs. As a fly fishing guide in Northern California I spend a lot of time in the sun. To avoid my dermatologist spraying too much liquid nitrogen on my face, and tainting the limited good looks I was blessed with I wear the Sun Armor Facemask. 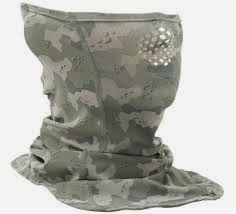 Prior to my local sales rep giving me the Sun Armor Facemask I had been wearing the traditional buff tube thing. I always had a few issues with it… One, the triangle sunburn that I would get from the area my buff never covered at the opening of my collared fishing shirt that I always forgot to put sunscreen on. Two, the danger of almost crashing my 17’ motor boat when blasting up or down river because my sunglasses fog up when I have my buff pulled up over my nose to protect my face from bugs. This situation would result in me trying to wipe my glasses while driving my boat and then inevitably a bug would fly in my unprotected eye and then I would be forced to drive with one eye. This leads to a serious reduction in my depth perception that is a hazard not only to myself, and anyone in my boat, but everyone else on the river. I have always had these issues with Buffs and I have never shared them with anyone, I just assumed they were a small price to pay for a face free of skin cancer and liquid nitrogen burns– though I have had enough triangle burns I may have off set any benefits at this point. The beauty of the Sun Armor Face Mask is Simms addressed these issues – little things my friends. Simms created a longer split neck line section which results in a flap that I can tuck in the back and front of my shirt preventing the burning triangle and even created laser cut breathing holes that prevent my glasses from fogging up and me crashing while blasting around in my motor boat. Now, I am sure these were not intended results, but these are the little things that Simms pays attention to and in doing so created the best facemask on the mark. Lower Yuba River - Flows are around 690cfs and are rumored to be dropping down to 500cfs soon. This is incredibly low, I have not seen the river below 700cfs sense I was a kid back in the early 90's. Clarity is about 1', about as clear as I feel confident I can catch fish. Englebright lake is blow out and as a result I imagine the river will be colored up for a few weeks. That said fishing was good yesterday. We hooked fish on Rubber legs, egg patterns, and 12-14 attractor nymphs like copper johns, prices, and various rubber leg nymphs. There were good numbers of skwala stoneflies around and a few areas where fish were actively eating adults in swirls and coves. Fishing the water along the banks blind with a skwala dry did rise a few fish but we had much better luck fishing to rising fish. Fishing on the L.Yuba should continue to be good as the water clears a bit but hopefully it keeps a bit of color as the river at 500-700cfs and gin clear could be pretty tough. Break In - If you live in Northern California you probably know of the fly shop Fly Fishing Specialties in Citrus Heights. Unfortunately they were broken into over the last weekend and a bunch of high end gear was stolen. From what I have heard it was a pretty pro job and one done by people that knew what to steal. So, if you see any of the following items on craigs list, ebay, classified bulletin boards, or on the inside of a guys trench coat on the corner or your local river access let Rick at Fly Fishing Specialties know and he will send the the goon squad out after them. It is a rare time when I feel my boxes are full to the point that I can divert from the normal grind of guide, tie flies, guide, tie flies, guide...and work on some flies or experiment with some new materials and such. I bought some of the new spirit river UV2 dubbing. I got the tan scud/shrimp and an olive one...both looked really good in the bag and Tom Page at Reel Anglers showed me a cool amber wing caddis pattern he used the dubbing on so I was sold. Buying dubbing is the equivalent of buying a new flavor of potato chips...the cost is minimal and the purchase has the chance of changing your life for ever. Usually when I get a completely new style of dubbing like this I tie a few standard patterns with it that I know fish and see how they fish tied with the new dubbing. Then if they fish well or better then I know the dubbing is good. So, with these two I tied some basic olive and tan birds next to see how the stuff works. So far so good, we will see how the fish like the stuff though. One thing with these dubs I have been doing is chopping a clump of it up before I use it. It is a blended dubbing and has some really fine synthetic material in it blended with some long stiff angora style fibers in it, so by chopping it the angora gets a bit shorter blending with the shorter fibers a bit better. I am addicted to music and buying music. I got into a few bands on the record label "Top Shelf Records" and it has resulted in my pretty much loving every band on the label. The latest one, Chamberlain is GREAT. Good american rock and roll. Singer sounds a bit like John Mellencamp to me...which really who doesn't like. Also discovered Dave Hause, another great song writter and his new CD "Devour" on Rise Records is great. Pitchers and Catchers have reported and the giants have had their first full team workout. They open up the Spring schedule on Feb 26 against the A's and then start playing everyday for the most part that Friday. I am pretty excited about the season and the new additions of Hudson and Morse. I think Hudson is going to be a great mentor to Tim L. and with Tim L's new off season program I am curious to see how he shows up to camp and how his spring goes...considering he is usually terrible during the spring. either way I will going to the mall this coming week and taking part in a spring ritual of buying by giants cap. I will wear this cap all season, almost everyday on the water and off, through thick and thin for the whole season. Kind of a big day for me.